With the AXA Toucan Folding / folding lock the bicycle accessory manufacturer comes with a new invention around the corner. The AXA Toucan is the next Faltschloss made by AXA and may be regarded as the successor of AXA FLC. We make it at least. Why successor? The AXA FLC 800 has not quite as good when complete practice text in terms of safety and could be cracked by conventional bolt cutters. We look at the AXA Toucan test the new model more closely. Who ordered the newfangled Faltschloss, everything gets delivered to his own bicycle to secure it and to transport the Castle comfortable. The delivery includes the lock, 2 keys and a holder for the bicycle frame. Also present, an installation and operating instructions. Besides two screws there are two Velcro straps with the package. More on this later in the paragraph for installation. The material used makes a good impression, it acts with value and the weight suggests a very high quality. The 1515 grams (weighed by us) make perfect impression in his hand. When folded and open comes the Toucan on a length of 120 cm, making it the largest version of this model. Alternatively, there is the Toucan even in 80 cm length. Our experience shows that 80 cm Folding are often too short for connection to an object. The castle closes very clean, a wobble and rattle is available according to the type, but does not fall on a negative. Whether this even after prolonged use is still so, will show our long-term test. We are the Castle rain and sun expose to judge the behavior under the weather.Some Folding have quite severe closed after rain paarmaligem use. Only the plastic which forms the shell of the castle, gives the impression that it may well break under colder temperatures. With just more than 1.5 kg, the Axa Toucan is anything but a lightweight. When AXA Safety Index, the Toucan 9 gets 15 points. In comparison, the AXA FLC 800 also has a safety index of 9 and the AXA Defender RL has a safety index of 12. (Source: Official website axasecurity.com). The bracket is very simple, but fulfills precisely the purpose of what it is for. We Bolted the bracket to the known frame holes. Who here a water bottle holder has mounted, quickly gets problems or must resort to the already mentioned above Velcro. For this purpose the holder is molded with a curve that is to improve the fit to the frame. Here the radius is selected to be very small, wider than the vertical frame tube of the assembly site should not be. The holder can therefore either screwed, for this purpose tools are required, or by means of Velcro tape (tools) are mounted. What struck us in our 28-er Herrenrad the castle comes to the down tube of the frame. Here, the distance is so small that there is contact between the castle and the lacquer / frame created during the journey. The alternative is a higher assembly. Are the holes too deep, to resort to the Velcro here. Too high, however, one must the AXA Toucan not mount. With its proud 26 cm height you quickly reach the top tube and the lock must then sideways slide into the holder. In this castle locked via a small button.About this dissolving the joint lock again. We know the flashy orange from Kryptonite Evolution 4 , thieves can see the orange as a signal color well and know from afar, here is secured. Whether this also deters, we do not judge. The castle itself is reminiscent of the Toucan Bird, his beak, so probably the name. With an ordinary bolt cutters it Unable to open the lock. 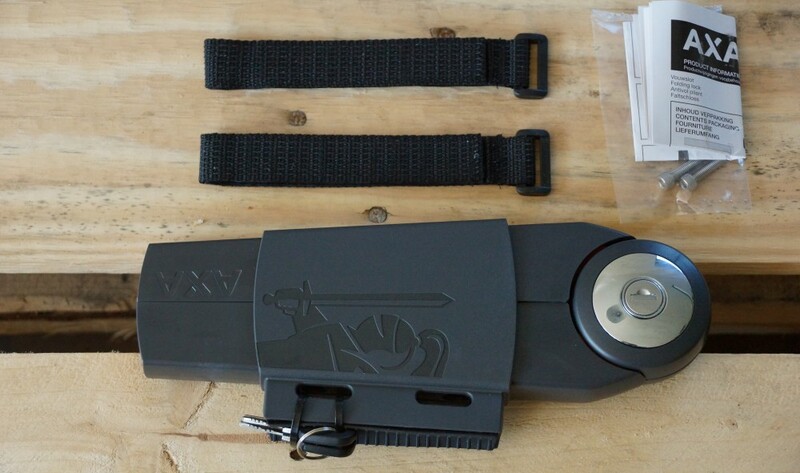 Here the new AXA scores bike lock.With cheaper suppliers we were able to open after a few seconds the castle here. The folding lock is another lock on the market. It is not difficult to see, the wheel has not been reinvented here by AXA. It is set on a proven technology from Folding and enriched with a new idea. Fewer members means less flexibility. 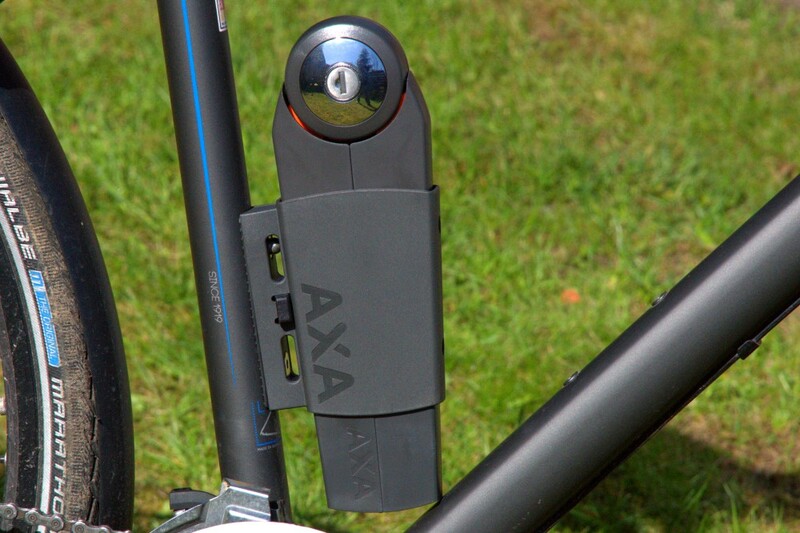 The AXA bicycle lock is very powerful in size and has its weight is anything but an easy solution. When fixing smaller frames may well have problems. Who would like to end his bike so and the lock will go through as a rim, should take half an hour to minute. Even if the members are coated with plastic, this can lead to slight damage. However, this applies also for bicycle locks of many other manufacturers. With its 120 cm, the lock can be easily used to connect the bike to other objects. This increases the fast theft protection. The closing mechanism is a bit clunky. The large «head» is divided into two parts and forms with the first member of rigid construction. Point deduction gets the castle for its weight and size. For eye-catching color, there is a small plus. The incoming slide in the bracket is very simple, you have here accordingly and place in the frame, this is done in a few seconds. We awarded the AXA Toucan test 4 out of 5 points.